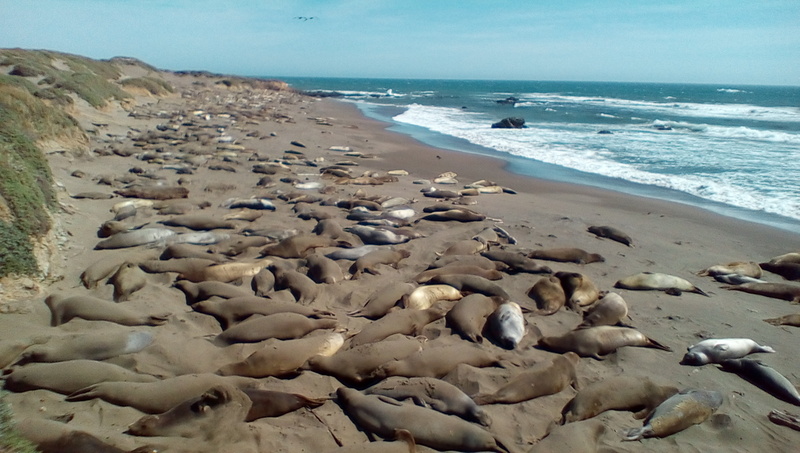 The six-year-old male should be dozing on the beach along side hundreds of other female and immature male sea elephants. But he wades in shallow water just offshore, trumpeting to no one in particular. The mothers, just back from a post-pupping migration and most of the immature males are molting. They must grow new skin and hair before starting off on their annual migration to Alaska. It would be counterproductive for them to swim so they melt into the beach. When too hot, they use their flippers to cover themselves and their neighbors with sand. All is calm on the beach until the six-year-old swims ashore and picks a fight with a slightly smaller male. Both raise up their heads, show teeth, and then collapse into sleep on top of each other. A small group of loners have staked out an empty beach for themselves away from the group hug on Piedras Blancas beach. I’d probably spend my molt with them rather than join the rowdies around the corner. This entry was posted in Uncategorized on April 28, 2017 by Dan Branch.